Did you check out the cartoon I posted on Saturday morning? 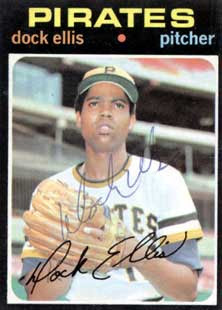 “Dock Ellis and the LSD No-No”? I didn’t mention that I know the journalist who conducted that interview with the former Pirate pitcher. He’s on my blogroll, in fact. Cheers, Donnell Alexander, for having a YouTube hit on your hands. 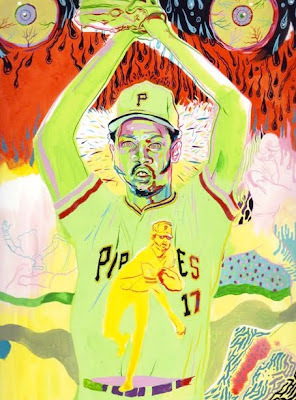 Turns out the tale of Dock Ellis throwing a no-hitter while tripping on acid is already deep in American folklore. Below are five different songs about it! Click the titles and stream the music on my Vox blog. Hope you enjoy these tracks as much as I do. It was very interesting for me to read the article. Thanks for it. I like such topics and everything that is connected to this matter. I definitely want to read a bit more on that blog soon. Below are five different songs about it! And nary a one by Parliament Funkadelic? I really like that artwork! It just feels so...right, you know? Anonymous, thanks for the link! Really enjoyed it.